“Collaboration is such an obvious idea because it allows people to focus on their skills, but team-work doesn’t necessarily come naturally to reporters. It should. “For the seven years that I was a business journalist at The Sentinel, there was a constant desire and pressure to find stories which would make the front page ‘splash’. “I would be incredibly loathed to share any tip-offs or contact information if I thought another colleague might use it to break news that I could report myself. “But I’ve had to change my attitude as I’ve moved to reporting on the web. Why? We delayed our post on the photo of two corporate torchbearers Tom Foley and Christos Angelides exchanging a ‘torch kiss’ to allow the newspaper to run the story first. The story was later picked up by the Daily Mail. The photo and story we published last week on the ‘torch kiss’ of two retail bosses has been picked up by the Daily Mail. The newspaper combines the story with one previously reported in This Is Staffordshire (but not credited): that of local torchbearer James Taylor, whose place was withdrawn two weeks earlier due to ‘failing Home Office checks’, despite Taylor having no criminal record and passed CRB checks previously. The piece suggests that Taylor’s withdrawal may be connected to the fortuitous scheduling that allowed the two bosses to carry the torch on sequential legs of the relay. It was This Is Staffordshire’s David Elks who found the image of the two corporate torchbearers when we approached him to ask if the newspaper had any images of those carrying torches through Stafford. Torchbearers do not normally have any control over where or when they carry the torch. 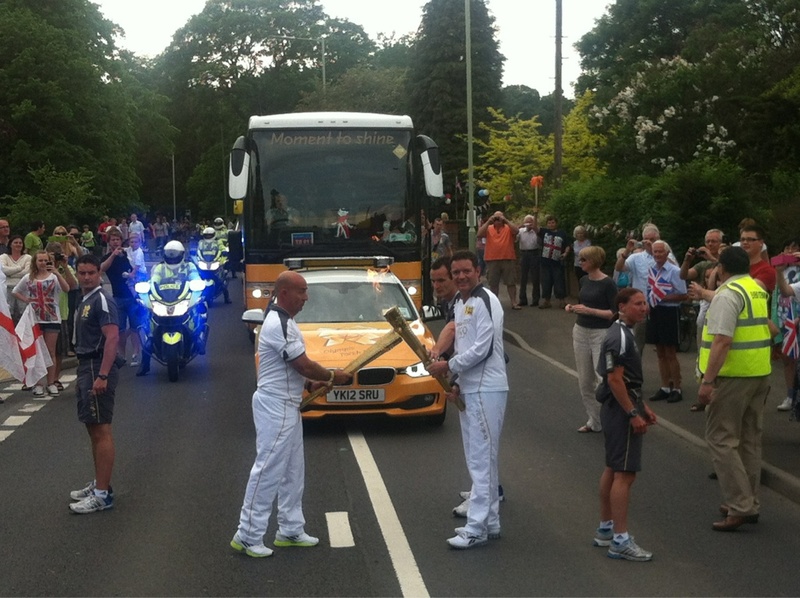 This appears to be the moment two retail executives exchanged an olympic ‘torch kiss’ on Wednesday as they carried the Olympic torch through Staffordshire. 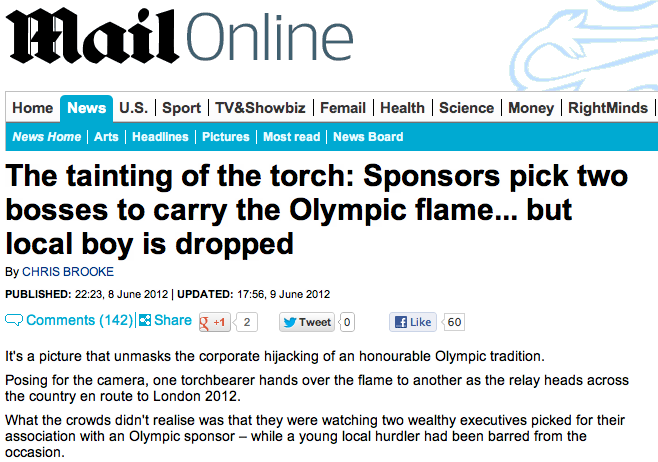 As revealed previously by Help Me Investigate Olympics, and now reported in The Independent, Daily Mail and Guardian, Intersport UK general manager Tom Foley and Next’s Group Product Director Christos Angelides were nominated by adidas to carry the torch because they had been “engaged in the business of sport for a number of years”. Providing help, connections and resources for those investigating the Olympic Games. Data roundup, February 27 | Школа за податоци – Македонија - Доказите се моќ on Raided reserves, extra staff, and lots of bunting: how did your council foot the £13m torch relay bill? Data roundup, February 27 | School Of Data – Greece - Evidence is Power on Raided reserves, extra staff, and lots of bunting: how did your council foot the £13m torch relay bill?